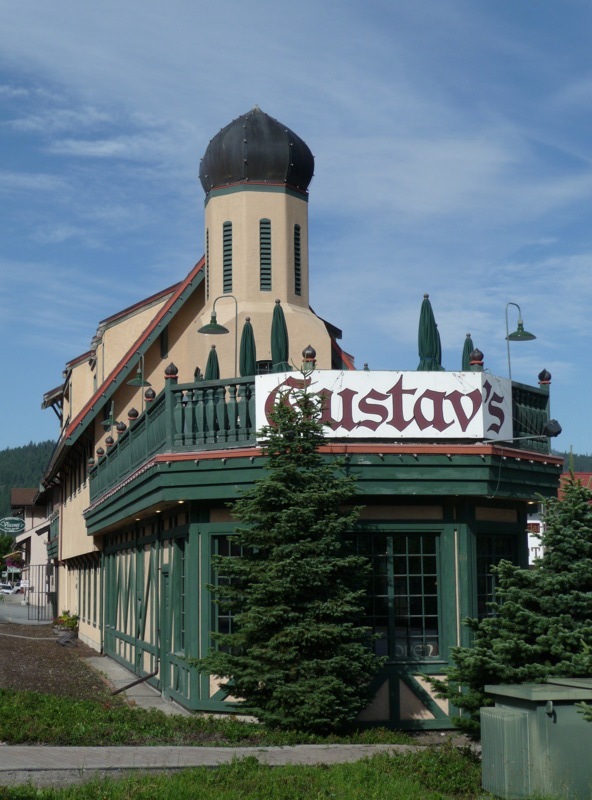 Gustavâ€™s is right on the main highway in a somewhat triangularly-shaped building (due to the shape of the side street leading off highway 2) and features a distinctive black onion-shaped dome. 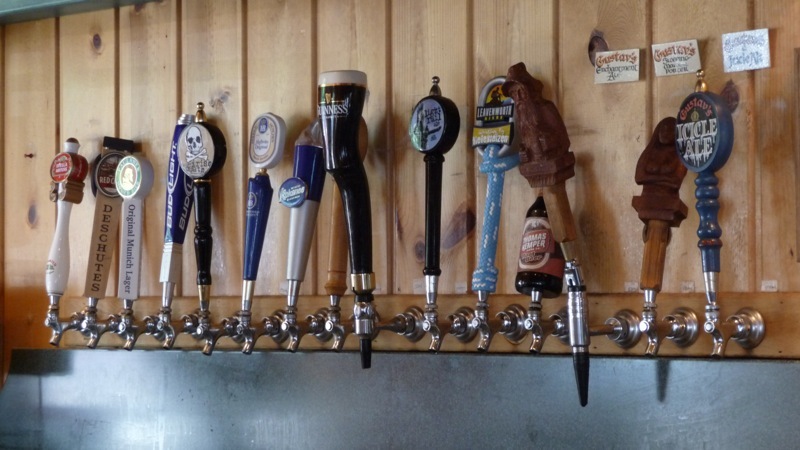 Itâ€™s really a restaurant, not a pub, but they have 24 taps. 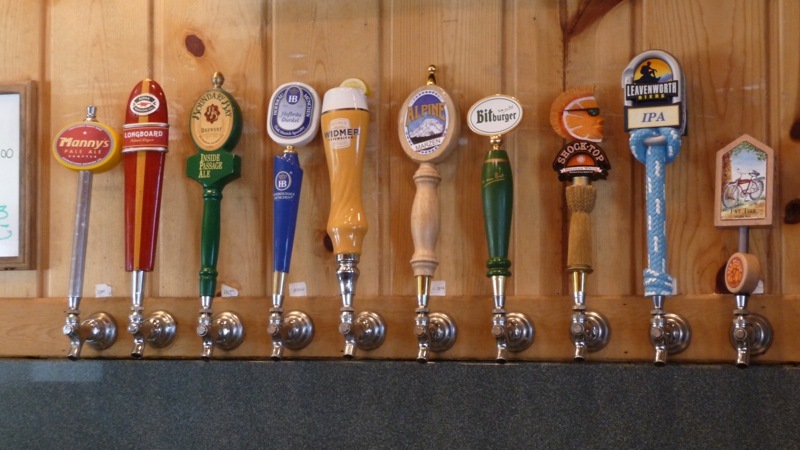 On our visit, there were three beers made by Gustavâ€™s (actually made by Icicle Brewing, founded by the owners of Gustavâ€™s and which will soon open a brewery and tasting room a few blocks away), four German beers, quite a good range of regional craft beers, as well as Guiness and Bud Light. The main room is fully paneled with light knotty pine on the walls and the tall ceiling which helps lighten up the place as well as give it a vaguely German/Northern European feel. Several huge wooden beams support the ceiling, attached to posts along the walls. Light wooden tables and captains chairs fill the room on top of dark green carpeting. Various historic alpine artifacts decorate the walls (e.g., snow shoes), and there are several big sets of antlers and somewhat odd light fixtures with decorative antlers. 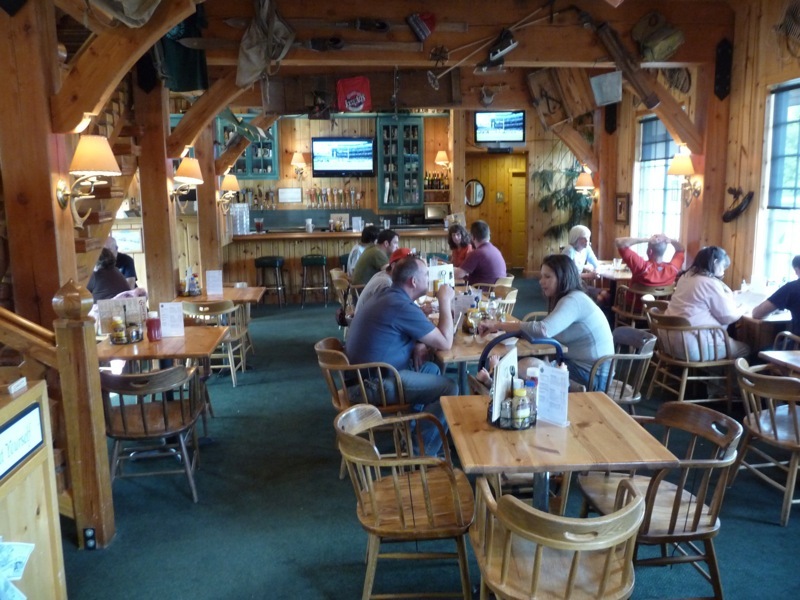 There is a second large room with a special wood-enclosed booth that is decorated with a nice wood-inlaid picture of the building. The outdoor area is on the second floor and is shaded by various umbrellas. The small bar is at the back of the main room and consists of a formica top with wood panelling below and six dark green padded stools. The bar back is fairly generic, in spite of the two glass-fronted cabinets with various ceramic beer steins. The food menu consists of a few different style burgers with fries, various sandwiches served with potato salad, halibut and chips, soups, several entree salads, German sausages, and a couple of desserts.